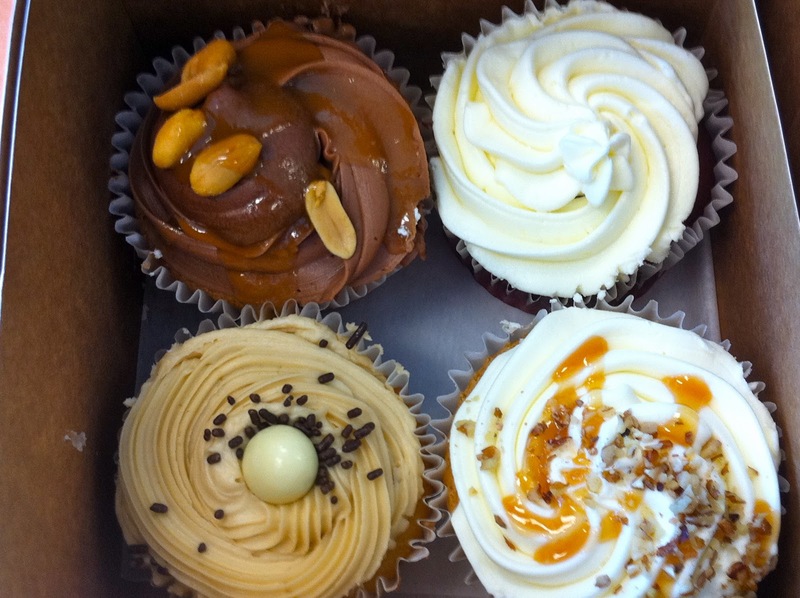 When it comes to cupcakes, I am quite the connoisseur. I have been to an innumerable amount of different bakeries and specialty cupcake shops all over the country and have also made quite a few of my own. I have been to Sprinkles, Baked by Melissa, Magnolias, Gigi's, Lucy & Leo's, and numerous grocery stores. I love cupcakes so much that I even thought that one day I would own my own shop and call it MonkeyCakes, having developed a slew of super unique and tasty recipes of my own over the years. So when I say, "this is by far the absolute best cupcake I have ever eaten in my entire life", I really mean it. Every year for my birthday, as far back as I can remember, my mom has made or had made a red velvet cake. My absolute favorite recipe is my grandma "Nanny's" and she truly is the only one that can make it right (I've tried a few times and failed sadly). Because my Nanny lives all the way up in Newton, NC, my favorite red velvet cake has only made a few appearances on birthday celebrations, as I usually get a slice during holiday visits. So, each year my mom has either attempted her recipe or outsourced to a restaurant or bakery. They have all been wonderful, but none quite as good as Nanny's. This was all until two years ago at my college graduation/birthday dinner at a lovely restaurant in Tallahassee called Cypress. My mom had made a reservation for me, my family, my boyfriend, and a few friends but the only problem was their pastry chef did not make full-scale cakes. Thankfully, the nice people at Cypress knew of a great bakery not far down the road that could make a mean red velvet cake perfect for our gathering. And boy were they right! Not only was our whole table blown away at how delicious the cake was, my mom actually whispered to me, "Goodness Shea, this might actually be better than Nanny's". Several slices and a few days later, I just had to find out where this cake had come from. After doing a little research and talking to a couple locals, I thought I had nailed down the place. Me and my roommate decided to go in and grab a cupcake to see if it matched the taste test. Sure enough it was a dead ringer. Not to mention the box the little cakes came in was identical to the one my cake came in several weeks earlier. So now every year for my birthday or other special occasions (or maybe just when I need to satisfy a little sweet tooth) we head to The Cake Shop. The Cake Shop is located on the Northeast side of town in Tallahassee and honestly doesn't look like much from the outside. But every time I stop by, there are always several people crowding in just to get a taste of their decadent cakes. And The Cake Shop isn't just limited to the fluffy goodness of cake but also make some pretty incredible cookies, brownies, and bars. Because I always default to my favorite red velvet cake, one of my best friends, Ashley, and I stopped in recently so I could taste a few of their different flavors. Ashley also had never been to The Cake Shop and I just couldn't let her be in the dark any longer about this incredible little place. Though they don't boast incredibly unique or hundreds of different flavors, they stick to what works best, simply delicious and moist cakes. 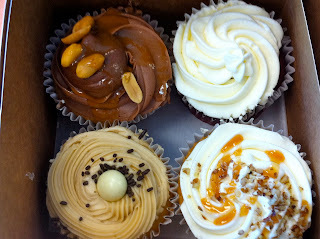 We tried snickers, espresso, caramel cream, red velvet, chocolate dipped strawberry, raspberry cream, and the elvis, a banana cake topped with creamy peanut butter frosting, a new favorite! Who would have thought that the best cupcake in America would be in little old Tallahassee, FL? If you ever happen to be passing through Florida's capital city, do not miss the chance to stop in at The Cake Shop. Their staff is always incredibly nice and helpful. They even gave my boyfriend a dozen cakes for free because it was the end of the day and they were closing! That certainly tells you something about the true baked fresh every day mantra. Please also visit their website and check out all the amazing flavors of cakes as well as bars, cookies, and brownies!